This large size miniature, measuring 38 x 28.5 cm., portrays Maharaja Mansingh of Jodhpur worshipping the twenty-armed Devi. Mansingh who obtained Jodhpur's throne in 1803 - something considered completely improbable, under the prophecy of Ayas Devnath, the head priest of Nath sect at Jalor, where Mansingh was hiding, was a staunch devotee of Ayas Devnath and follower of the Nath sect till his death in 1843. After the death of Bijay Singh in 1793, Bhim Singh usurped the throne of Jodhpur. Some of the contenders to the throne, including Bijay Singh's eldest son and the heir-apparent, Zalam Singh, were forced to flee and others were murdered. Mansingh had rushed to Jalor and was hiding at Jalor fort. In 1803, on hearing that Mansingh was hiding there, Bhim Singh sent him orders to surrender. 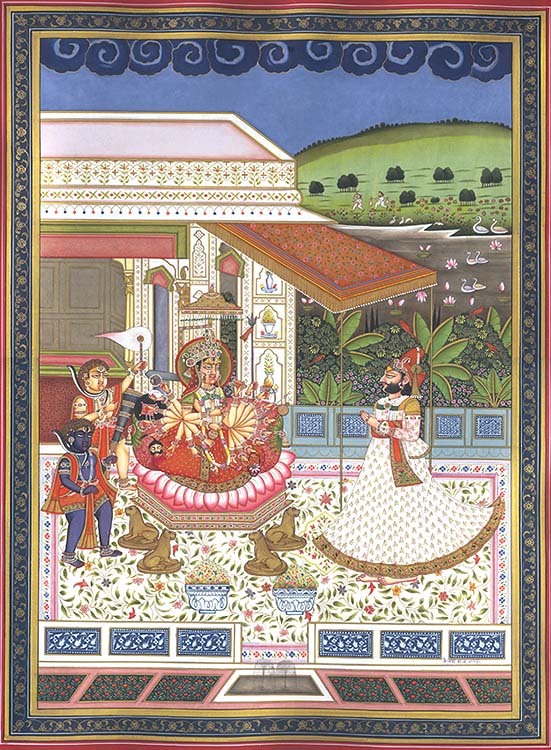 At this critical juncture Ayas Devnath, who he visited to seek guidance, announced that before Diwali - Indian festival of light, Mansingh would become the Maharaja of Jodhpur. The prophecy worked, and quite in advance to Diwali Bhim Singh died. Mansingh was the lone contender to Jodhpur throne. Jodhpur's Thakurs - nobles, asked him to reach Jodhpur and take over. This deeply influenced Mansingh and he decided to rule the state in the name of his mentor and brought him and his four brothers to Jodhpur, built for him a huge temple complex with residence and allotted many villages. Ayas Devnath, his spiritual teacher, was also his political guide. but a painting portraying him worshipping a divinity other than his mentor is not, at least widely, reported. Thus, even if contemporary, the painting, as it truly reveals the past, is of rare significance to art historians, scholars and others. The twenty-armed Devi, carrying various attributes - both Shaivite and Vaishnavite, in her hands, is seated on a fully spread lotus laid over a hexagonal golden chowki. Six lions support six corners of the hexagon on their heads like its legs. The chowki is laid against a beautifully wrought marble pavilion comprising a massive golden partition, or door, under a beautiful canopy adorned with golden fringes and supported on golden poles. She has over her head a gems-studded golden chhatra - umbrella. On her left stand in obeisance Shiva in two forms, one with golden complexion, and other, blue, representing him in his Bhairava manifestation. This form of Devi manifests her all forms including Bhairavi, hence, Shiva in attendance in his two aspects. Quite meaningfully, Shiva proper is waving a flywhisk, while Bhairava has a morachhala - flywhisk made from peacock feathers, which usually those practising occult arts use. Bhairava, being the presiding deity of tantra and occult art, rightly has peacock-feathers bunch. In front of the Goddess stands Maharaja Mansingh with folded hands. Besides the Man-shahi turban adorned with his chosen crest and ornaments, he is wearing a wide and long flared jama with full sleeves identical to what late Mughal emperors, particularly Farrukhsiyar, wore. The sash - red and wrought with gold wires and inlaid with precious stones, is worn above the waist almost around the belly. Background is conventional. Beyond the trellises is the usual garden with banana plants, Saptaparni trees and colourful parrots. Ahead the garden is the lake teeming with louses and aquatic birds. On the other side of the lake is green slanting patch of land looking like a hill, and above is the dark blue sky with curling clouds of deeper blue on the apex.